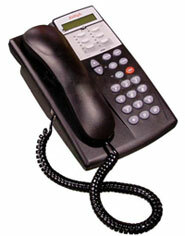 The Partner 6 Button Telephone Set has 4 programmable buttons with dual LEDs for line or feature appearances. Built-in conference, transfer, hold, and speaker buttons. Full duplex speakerphone for hands free operation. Built-in port allows for connection of standard devices, such as modems or fax machines. Compatible with all Partner systems. The Partner 6D Display phone has all the same features as a Partner 6 phone plus a 2-line display. 4 programmable buttons with dual LEDs for line or feature appearances. Built-in conference, transfer, hold, and speaker buttons. Full duplex speakerphone for hands free operation. Built-in port allows for connection of standard devices, such as modems or fax machines. Compatible with all Partner systems.